OK – all the whining about ‘no bears’ brings us back to the grizzly. This adult male was kind of enough to give me a few cool poses, of which I think this is one of my favorites. There’s little more to be said other than ‘bears rock’. 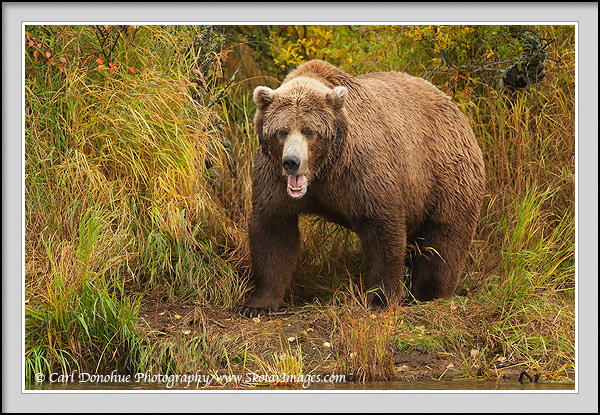 This entry was posted in Alaska, Fall, Grizzly Bears, Katmai National Park, Wildlife and tagged Brown bears, grizzlies, Grizzly Bears, Katmai National Park, mammals, Ursus arctos, Wildlife on October 11, 2009 by Carl D.
Another sweet shot. Great golden light. The clearing certainly completes the composition well. This one is an example of how knowing a place can help. The bear was wandering up the river, following the shoreline, and I kinda knew he’d come out here. The light was just right for this type of photo, so I was pretty lucky for it to come together like this. The power behind a bear of that size is amazing. I like the pictures and looks like the bear was liking the attention.